"For 10 years, Graeme Clark had been working tirelessly to develop an implant that would help the deaf to hear. [...] There was one seemingly insurmountable hurdle: how to actually get the implant into the intricate spiral of the inner ear. During one Melbourne summer in 1977, he took his young children to the beach to escape the heat. While they were playing in the shallows, Clark noticed a seashell lying on the ground -- and that its helical structure was a crude replica of the human cochlea. Inspiration hit. 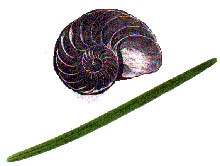 He pulled up some grass blades and experimented with teasing them into the shell's opening. Owing to their flexible tips and stiff bases, the blades slid smoothly into the tightening spiral. It revealed a simple solution to a complex problem. Rushing back to the lab, he confirmed that wire electrodes following the same design as a grass blade would solve his problem. Designed with progressive stiffness, the electrodes could be made to travel the length of the cochlea, all the way to the nerve cells that code for speech."